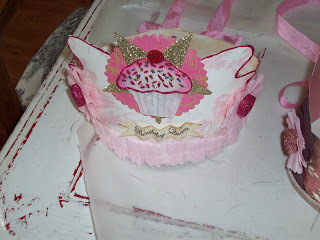 After I finished the cupcake crowns it was on to boxes. I had to make some for a wedding. Bridesmaids gifts. 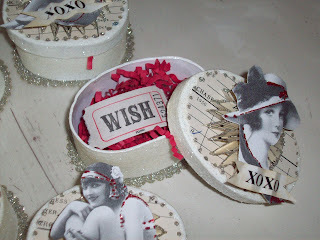 Actually bridesmaids gifts will be going inside the black, white, and red boxes. The bride wanted all black, white and red for her upcoming wedding. 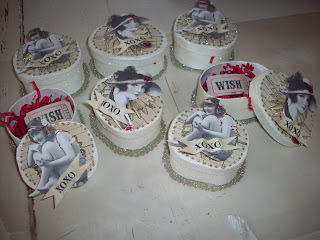 The next set of assorted boxes is going to a new shop in Pennsylvania!! The shop is owned by Genevieve of Bella Enchanted. 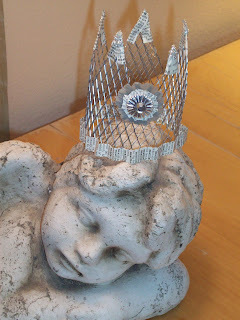 She will also be getting my French Candy containers, and my various crowns. She is keeping me quite busy this week and next. I will keep you posted with more photos as I finish the projects. Sorry if I haven't visited much this week, but you can see why. I have no little elves helping me in the studio. Just me. 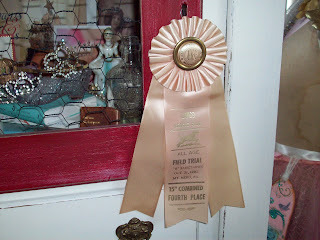 I am stringing the ribbons through the candy containers as we speak. One is actually sitting on my lap. 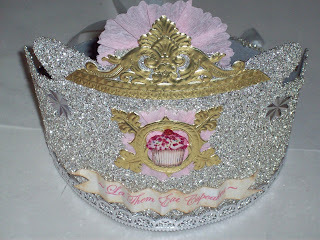 Tomorrow I deliver the cupcake crowns. Hope they like them. 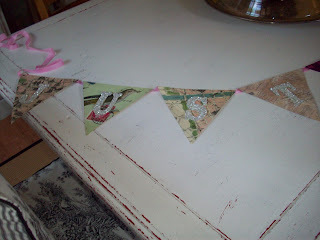 If you ever see anything on my blog that is not in my Etsy shop, I will be happy to make one for you. 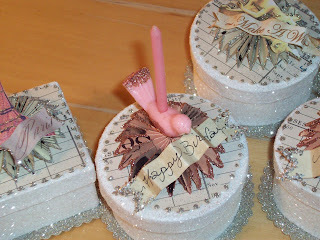 I get many special and custom orders. It's a lot of fun! Baby update, if you haven't read my daughter's blog this week (Click on Baby Balice Blog) on my blog list. She found out this week that she is having a BOY! No pink, glitter, or crowns yet. Either way, it's all very exciting! 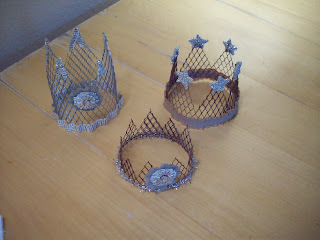 All of these yummy crowns are headed to the cupcake shop in my town. 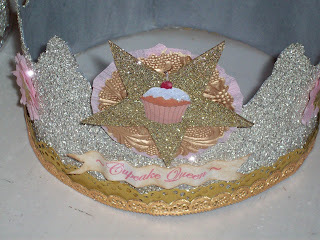 It's called the Cupcakery cupcake bakery and boutique. It is owned by a mother and daughter. They are the sweetest, nicest, and best cupcake makers ever. They use the freshest ingredients, and never cut corners. They are next to the salon where I get my nails done. That is how I met them. 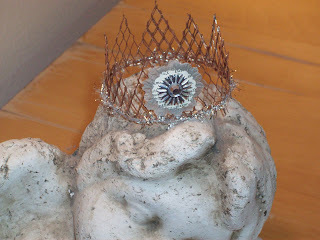 I have been making them things from time to time, and they just decided to carry some of my crowns for birthdays etc. 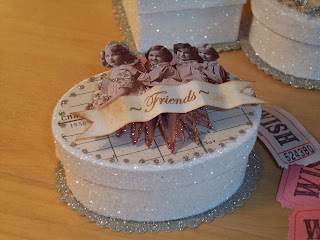 I still have much more work to finish this week, but thought you would like a peek at the first finished projects. and headed north on the 101 for the 2 hour drive to beautiful Nipomo California. 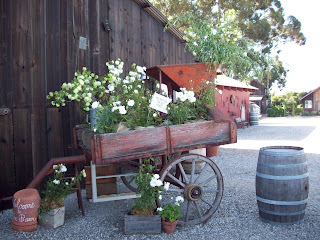 It is a rural area beyond Santa Barbara and before Pismo Beach. If you recall last fall I went to the same sale. It's in a beautiful barn, on an amazing piece of property, owned by the Watkin's family. 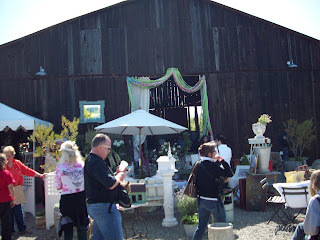 The barn is normally used for functions such as weddings, parties, showers etc.,but 2 times per year it is open to the most beautiful, French, shabby, lovely vendors you would ever want to see. We arrived right on time, at 9:00am. People were already in line to get in. 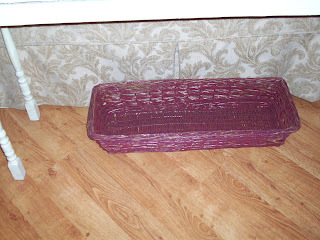 It's a pretty girly girl sale, so they have a wonderful seating, (holding cell for husbands) cushy couches and chairs, coffee, scones, cookies, fruit etc. Mark and I parted ways, and I headed into the barn. Not what you would think the inside of a barn would look like. Beauty hits you right in the face the minute you walk in. 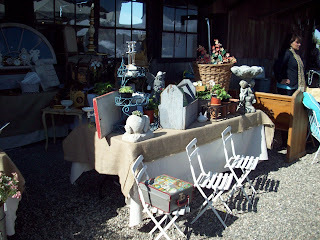 Each vendor has their area set up like the most beautiful shop you have seen. Just as I started looking, I hear my name being called by my friend Jennifer Grey. We were planning to meet and shop together. 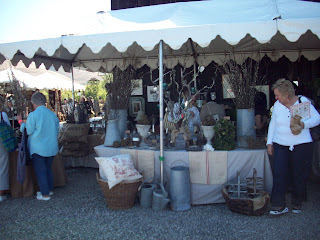 She is a seasoned vendor herself, so I loved having her input and ideas. We had such fun!! We would shop, and carry our packages back to our husbands for safe keeping. As you can see from the photos, I got just a few choice little things. 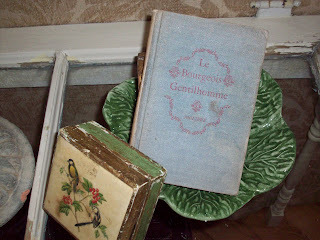 A French book, a lovely square tray, angel wings, reindeer moss, that will actually stay that amazing shade of green, this great jar with a zinc lid perfect for a fairy house, pretty printed white bags, that I will turn into something magical, a pretty little planter with the plants included(thanks to Jennifer). All in all it was a wonderful day. My husband met some really nice guys all sitting around waiting patiently for their wives. After several hours we took off up the coast for a little lunch. 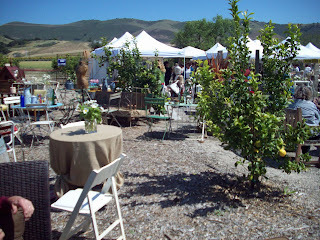 A great little place in Arroyo Grande. I hope you had a fun Saturday too!! 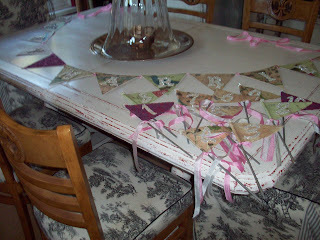 I promised a picture of my cute little find at last weeks garage sales. 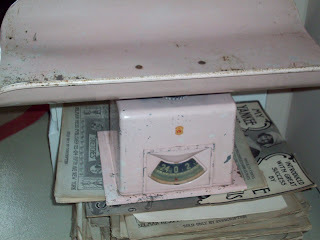 I found this vintage pink baby scale for $5. 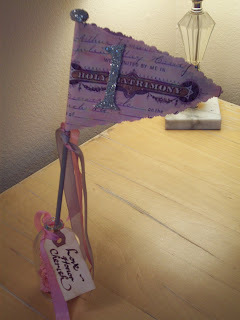 I am going to use it as a decoration at the upcoming baby showers we are having. Hope you enjoyed my field trip! Hope to chat again soon, but I arrived back home yesterday to several phone calls, and emails for orders. I will be back working in the studio all week. Don't worry, it's a lot of fun to create for people. I will post photos when work is done. PS, did I use the words great, amazing, and beautiful enough? We have a winner! My husband Mark, pulled this name from the jar this morning as he was running out the door for work. 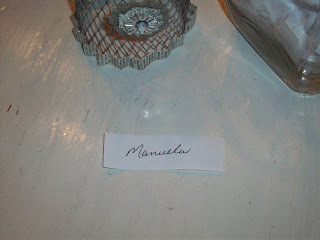 It's Manuela! Congrats, you are now the proud owner of the crown you see in the picture. I hope you like it. Please email me with your address. 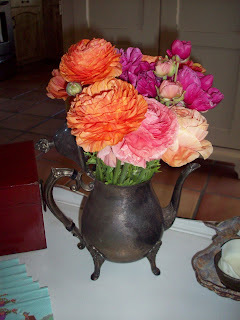 Thanks to everyone for reading, and liking my blog. 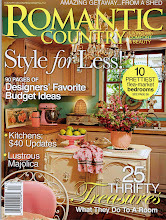 It's so much fun to post what I do, and to see what everyone else is up to. I'm so glad I started blogging in the first place. Glad I got to meet all of you. 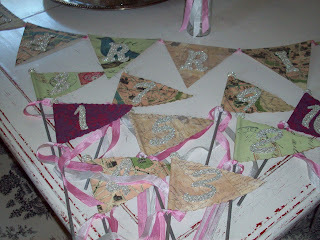 Well, the bride was just here picking up her banner and table number flags. Much to my happiness, she loved them! I'm so glad. It's one of those funny things. We think we know what someone will want, but until they actually see it and tell you, you just don't know for sure. We were on the same page. She loves the vintage look as I do. 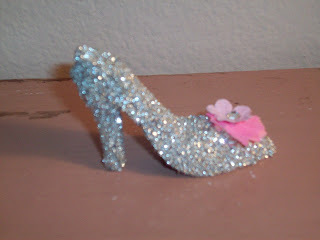 She also loves pink, and sparkly too! 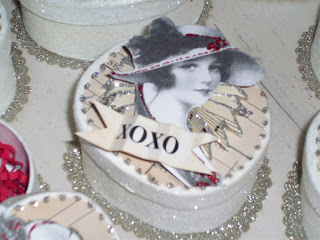 She is very sweet, and will be a beautiful bride this summer. I wish her much luck and happiness!!! I can't wait to see pictures of her wedding. 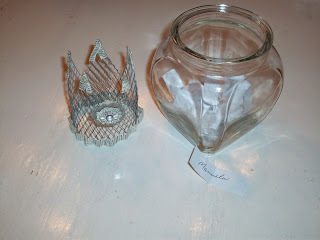 Please comment on my giveaway post if you haven't yet, as I am picking a winner tomorrow. PS, click on any photo to enlarge. I'm having a busy one, what else is new? 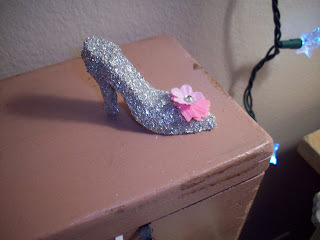 While waiting for glue and glitter to dry, I made this new sparkly shoe. 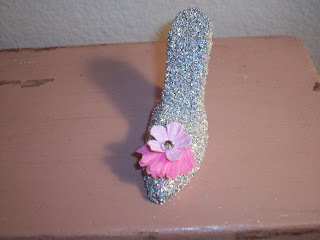 It's a Marie/Cinderella slipper. 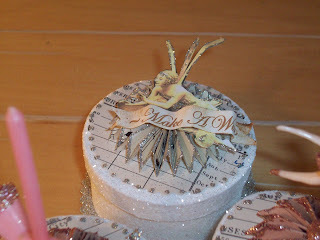 It's completely encrusted in my favorite glass glitter, and decorated with crepe and a crystal of course. I just added it to my Etsy shop for fun. 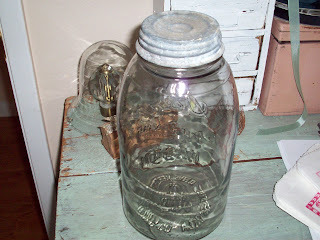 I will be posting pictures of the finished wedding projects I have been working on, as well as my garage sale find from last weekend, as soon as I get a chance. If you haven't already left a comment on the previous post, please do, so you can be entered in my 2 year bloggaversary giveaway. 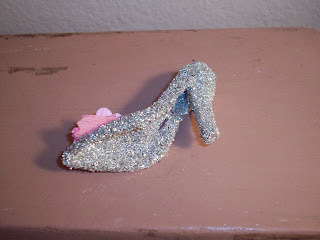 This shoe is sold!! I will make more! Ours was busy as usual. It started Saturday morning with my daughter Amanda. Our favorite thing, going to some garage sales. I will show pictures of my finds in another post. 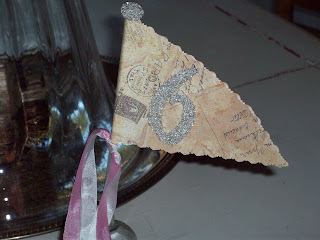 It's hard to believe I have been blogging now for 2 years! Wow!! I have made so many nice friends, and met wonderful people full of great ideas and thoughts. 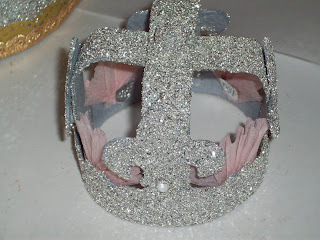 In honor of this historic occasion, I will be giving away one of these little crowns. All you need to do is leave a comment, and please, if you don't have a blog leave an email address so I can contact you if you win. I will choose a random winner on Friday!! Thanks for a wonderful, and fun 2 years! Can't wait to see what I post for the next 2 years. Have a wonderful week, and good luck! 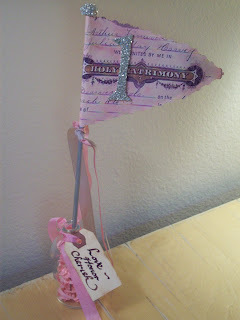 I have been busy working on some ideas for a new client's wedding. It's a long story, but the bride found me through the cupcake shop. I did a banner for the shop, and the rest is history. 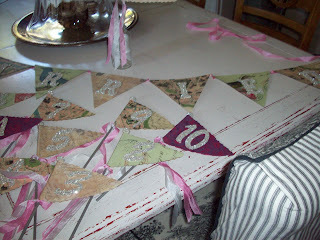 Anyway, she wants a banner that says Just Married, as well as cute table numbers. When the ideas and projects are done, I will post pictures. I hope you are having a great week. It's been abnormally cold in Southern California. It got down to the 30's last night. Which is weird for this time of year. It's suppose to warm up for the weekend though. 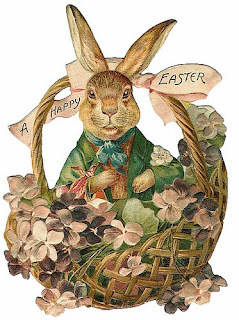 Hope you all had a lovely Easter yesterday!! We sure did here in sunny California. The weather was perfect. My husband and I had a wonderful brunch with my daughter, son in law and my mom! 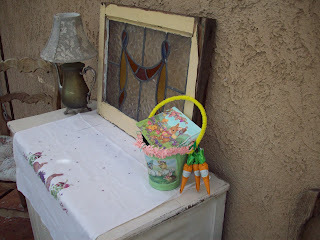 We ate, chatted, enjoyed the outdoors, and my daughter Amanda age 27 even had her Easter egg hunt. I'm sure Amanda will be adding more photos to her blog. 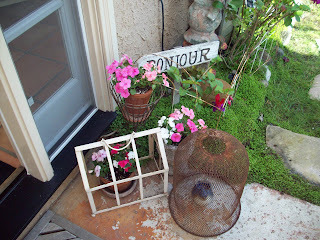 (Baby Balice Blog) Click on it from my blog roll. 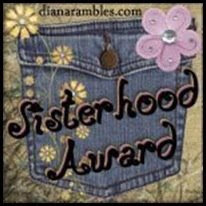 I wanted to mention that I got a wonderful Sisterhood award from Alli, I am going to pass this on to all of my bloggy girls out in blogland. I know, I am suppose to choose, but I can't. There are so many great, and creative women out there. 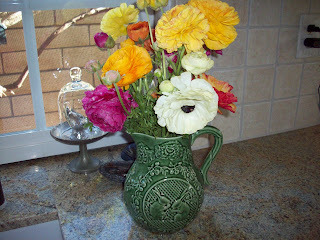 I enjoy each and every blog. I want you to notice I got another wonderful card from my friend Jean in Rhode Island. 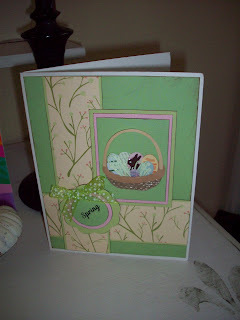 She makes the cutest cards, and she is the nicest lady. We have become such good friends. Now we just need to get together in person someday! I took a picture of my new French flags. I love the way they turned out. 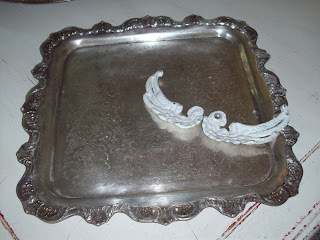 I was inspired to make some, when I saw them at a flea market. I changed the design, and put my own spin on them of course. It's funny where and when we might be inspired. 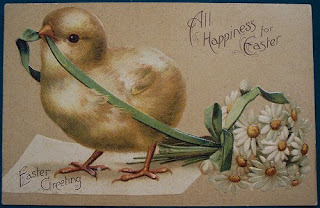 Just wanted to say Happy Easter, Happy Spring, Happy Sunday! 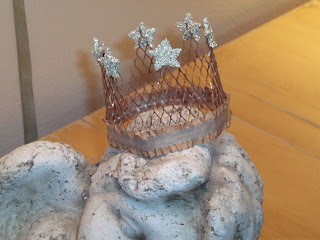 The tiniest crowns in the Kingdom! Maybe not, but they are mini and cute! 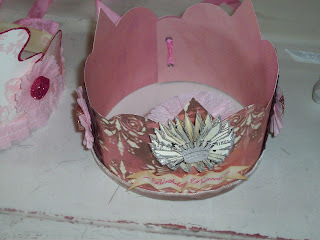 I took some time out from getting ready for Easter, to make some mini crowns. 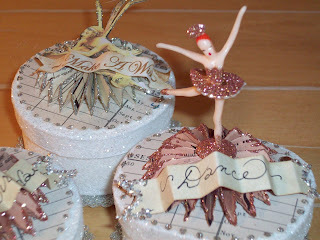 They were really fun to create, and make. 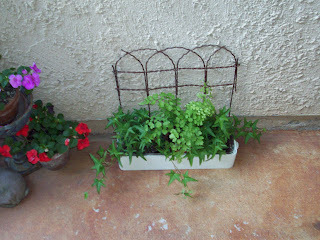 I made them from rain gutter screen. 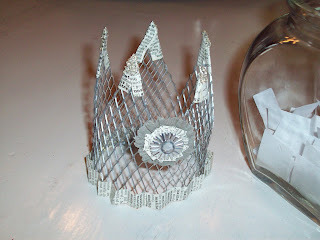 I have made large ones like this, but never this small. 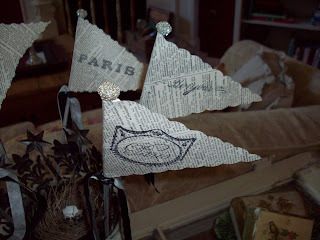 I used, lots of fun things to adorn them, like vintage French dictionary pages, crepe paper, tinsel, glass glitter,Dresden's, and crystals. 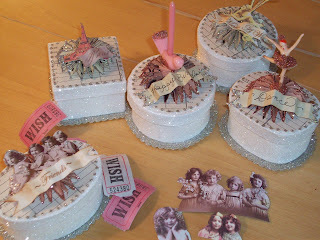 I hate to part with these little cuties, but they are going into my Etsy shop. I hope you are all having a great week. I still have not washed my windows, as another storm is suppose to be coming tonight. It's really putting a damper on my plans. I don't think they will get washed until Saturday. That way they will be clean for the Easter Bunny!